Kokandy Productions is pleased to celebrate its fifth anniversary with an expanded season featuring four fully produced musicals, including two Chicago premieres and two guest directors. The 2017/18 Season will also include numerous readings and workshops – adding fresh voices to Kokandy’s “New Works Initiative” and emphasizing the company’s commitment to becoming an increasingly relevant part of Chicagoland’s musical theater and new work development communities. The new season also marks Kokandy’s transition to a not-for-profit organization. Following The Wiz is Kokandy’s “Summer Series,” kicking off with the Chicago premiere of Michael John LaChiusa’s LITTLE FISH, an oblique parable for urban life after the attacks of September 11th, directed by Co-Artistic Director Allison Hendrix. Summer 2017 closes with the Chicago premiere of BONNIE & CLYDE from the creative team of Frank Wildhorn, Ivan Menchell and Don Black. NYC-based guest director David Alpert directs this story of two small-town nobodies searching for meaning at the height of the Great Depression. Kokandys’ fifth season will conclude in Spring 2018 with a soon-to-be-announced production directed by Co-Artistic Director John D. Glover. The full 2017/18 season will be produced at Kokandy’s resident home, Theater Wit, 1229 W. Belmont Ave. in Chicago. 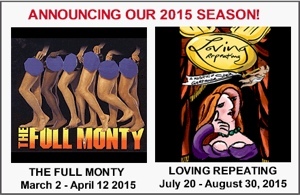 Season subscription and single tickets will go on sale at a later date. Musical theater classic The Wiz is an urbanized retelling of L. Frank Baum’s Classic 1900 children’s novel The Wonderful Wizard of Oz, in the context of 20th century African American culture. Follow the yellow brick road with a dazzling mix of rock, gospel and soul. The 1975 Broadway production of The Wiz won seven Tony Awards including Best Musical. LITTLE FISH – Chicago Premiere! Loosely based on Deborah Eisenberg’s short stories Days and Flotsam, Little Fish has been described as an urban parable for life after the events of September 11th. Thirtysomething writer Charlotte decides to give up smoking, and begins swimming to compensate for the lack of nicotine. With the help of her friends Kathy and Marco, Charlotte moves forward and backward in time, only to discover that she has spent her life running away. LaChiusa (The Wild Party) has said that “giving up smoking is a metaphor for the crises that force people to reconsider who they are and what is important.” The eclectic score includes Latin, jazz, rock, and what has been described as “pure urban noise,” a reflection of urban life, and the chaos within Charlotte’s mind. Little Fish premiered off-Broadway at the Second Stage Theatre in 2003. BONNIE & CLYDE – Chicago Premiere! Bonnie & Clyde centers on real-life Bonnie Parker and Clyde Barrow, the ill-fated lovers and outlaws whose story has been infamous since they achieved folk hero status at the height of the Great Depression. Fearless, shameless and alluring, the Tony Award-nominated musical from the legendary Frank Wildhorn (Jekyll & Hyde, Civil War, Dracula) is the electrifying story of love, adventure and crime that captured the attention of an entire country, with a non-traditional score featuring blues, gospel and rockabilly music. The world premiere of Bonnie & Clyde was presented at La Jolla Playhouse in 2009, and transferred to Broadway in 2011. There, it was nominated for three Outer Critics Circle Awards and five Drama Desk Awards (both including Best New Musical), as well as two 2012 Tony Awards nominations. Lili-Anne Brown (The Wiz) a native Chicagoan, works as a director, actor and educator, and has performed in, directed and produced many award-winning shows, both local and regional. She received the Joseph Jefferson Award in 2014 for her direction of Ahrens & Flaherty’s Dessa Rose, and a BTA Award in 2011 for her direction of Passing Strange. She is the former Artistic Director of Bailiwick Chicago, an Artistic Associate of Timber Lake Playhouse and a graduate of Northwestern University and St. Ignatius College Prep. She is a member of Actors’ Equity, SAG-AFTRA, and an Associate of Stage Directors and Choreographers (SDC). John D. Glover (Production TBD) most recently directed Kokandy’s The Full Monty (Jeff Award nomination Best Musical) and is thrilled to be back at it with Tomorrow Morning. For six years, John was responsible for the artistic and fiscal direction of the Theater Company of Purdue University and has directed regionally in Ohio and Indiana, including directing the grand opening production of the Theatre at the Center in Munster. John is the recipient of several Northern Indiana Excellence in Theater Foundation awards (NIETF), including Best Direction of a Musical for Pump Boys and Dinettes (Purdue Theater Company) and Best Direction of a Musical for Floyd Collins (Towle Theater), as well as a Lifetime Achievement Award in Regional Theater. In the “real world,” John is the Chief Operations Officer of a not-for-profit, faith-based senior living ministry. The company’s artistic staff is comprised of John D. Glover (Co-Artistic Director), Allison Hendrix (Co-Artistic Director), Scot T. Kokandy (Executive Producer) and Kory Danielson (Resident Music Director).